The New York Rangers played it straight throughout a second consecutive playoff-less season, refusing to engage in a race to the bottom of the NHL for the better odds of a top draft pick. The resulting good karma, if you believe in that sort of thing like coach David Quinn and general manager Jeff Gorton do, has perhaps helped set them up for an offseason that should be infinitely more interesting than most of the 2018-19 campaign. Despite hurting their draft lottery odds by going 1-0-1 in their final two games to complete an admirable 32-36-14 season effort, fate smiled upon the Blueshirts in the form of being awarded the No. 2 overall pick Tuesday, jumping four spots. 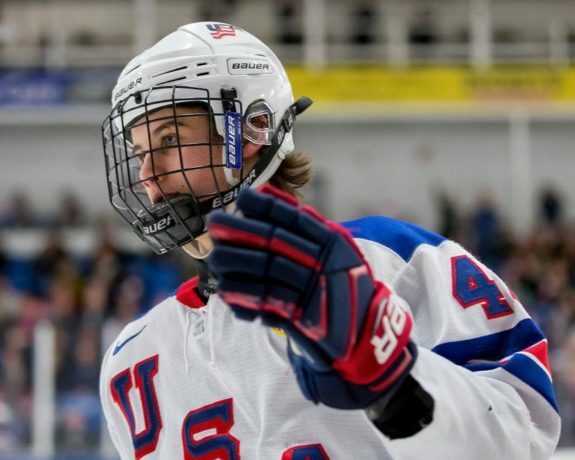 Choosing in that spot for the first time since selecting Hall of Fame defenseman Brad Park in 1966, the Rangers will end up with one of the top two elite prospects in the draft – American center Jack Hughes, the consensus No. 1, or more likely Finnish forward Kaapo Kakko, who just might prove to be the better option for them anyway. “You know what, that final game in Pittsburgh where we won it and by doing so it could have cost us as far as draft position, all the coaches were together in our room and to a man, it was, ‘I don’t care,’’ a clearly excited Quinn said. If you do things the right way, you’re going to be rewarded. I believe that’s real. The Rangers’ rebuild, like any other rebuild, yielded plenty of frustration to go along with optimism this season – the inherently halting process delivering visions of a bright future mixed with doubt that a return to contention is close. However, the opportunity to take one of the top two talents in this draft, both seen as potential future franchise players, has helped ground – and possibly accelerate – the arduous reconstruction project. 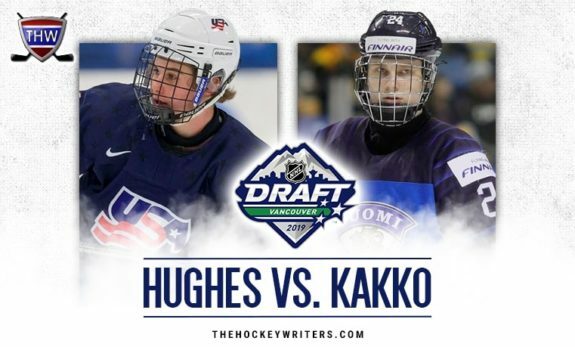 Kakko or Hughes will in theory be the player the Rangers build around, the type of dynamic young star they never possessed during their recently ended 12-year run of playoff contention and to whom they have rarely had access throughout their history. Adding either to their group of youngsters who are trying to establish themselves in the NHL should inject more confidence into the lineup immediately. Perhaps just as importantly, either player should prove to be a pull for free agents. Think Columbus Blue Jackets star Artemi Panarin might want to have a fellow European such as Kakko as his running mate for the next seven seasons or so? Comparisons can always be dangerous when it comes to unproven players. It’s difficult, though, not to draw parallels between Kakko – again, the one more likely to be a Ranger next season — and Winnipeg Jets sniper Patrik Laine, himself a Finn drafted second in 2016 behind Toronto Maple Leafs center Auston Matthews who has proved to be quite the consolation prize for the Cup contenders from Manitoba. “The opportunity to get a player of the caliber we’re going to have an opportunity to get is a great opportunity for us to move this thing along,” general manager Jeff Gorton said. Gorton would of course be thrilled to take Hughes should the New Jersey Devils stunningly pass on him with the No. 1 pick, which would leave the Rangers with a player whose dynamic skating, elusiveness and incredible puck skills have led to Patrick Kane comparisons. The GM knows, however, that the club could all but start manufacturing Kakko jerseys now – and it’s possible Quinn has his fingers crossed for that more predictable situation to play out at the top of the draft June 21 in Vancouver. The smallish Hughes plays a different game than Kakko, who at 6-foot-2 and 190 pounds, brings a physical edge along with his skill and scores plenty of goals in the high-traffic areas around the net – coincidentally, just the type of player Quinn is looking for as he and the front office attempt to remake the Rangers in a more jagged, gritty image. Kakko’s stock skyrocketed with a dominant season in the Finnish Liga, as he recorded 22 goals and 16 assists in 45 games for TPS Turku. “I believe in karma and the hockey gods and doing things the right way,” said Gorton, who revealed that he carried the shield of late NYPD Detective Steven McDonald to the lottery drawing for luck, given to him by McDonald’s family. “We talked about that a lot with the coaching staff, about how doing things the right way would benefit us in a lot of ways, and this is one them. 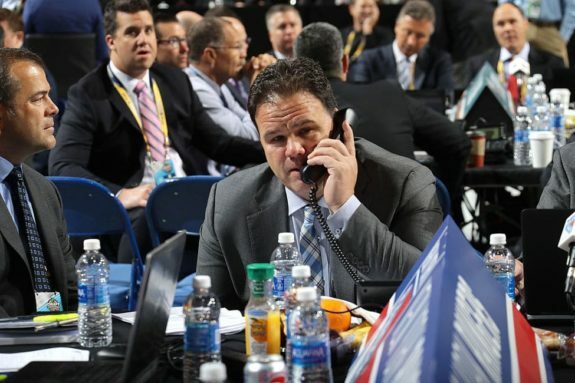 Gorton will have 10 total picks, including two first-rounders and three second-rounders. One of those second-rounders would become another first-rounder if the powerhouse Tampa Bay Lightning, who entered the tournament as overwhelming favorites, win the Cup – a condition of the Ryan McDonagh-J.T. Miller trade last February. That process, unfortunately, is not off to an encouraging start. The Blue Jackets stunned the Lightning 4-3 in Game 1 on Wednesday on the strength of four straight goals and then routed Tampa Bay 5-1 in Game 2 on Friday. So while eagerly awaiting an outcome at the top of the draft that seems all but predetermined, the Blueshirts’ faithful can invest themselves in rooting for a Lightning run at the title, another pick in the first round being the prize. And can any Rangers fan honestly say they don’t feel at least some desire to see old mates McDonagh, Miller, Ryan Callahan, Dan Girardi and Anton Stralman skate with the Cup? There’s more: thanks to the deadline trade of Mats Zuccarello to the Dallas Stars, the Rangers’ first-round haul could reach four selections in the unlikely event the Stars upset the top-seeded Nashville Predators in the first round and then go on to reach the Western Conference finals, and Zuccarello plays in at least 50 percent of Dallas’ games over the opening two rounds. That would covert the second-rounder the Rangers received in the trade into a first-rounder. The Stars knocked off the Predators 3-2 in Game 1 on Wednesday. Then, there’s free agency – and not just the obvious pursuit of the superstar Panarin. If the Stars fall in love with Zuccarello and re-sign him this offseason, the 2020 third-round pick in the trade also becomes a Rangers’ first-rounder next year. So, there’s plenty of spring/summer stimuli for fans of a team that didn’t come close to making the playoffs. Oh, did we mention that another highly skilled European forward prospect, Vitali Kravtsov, is expected to arrive from the KHL next season? Kakko, Kravtsov and Panarin could all be in Blueshirts’ opening night – along with young defenseman Libor Hajek, who lived up to his considerable hype in a short NHL cameo before injuring his shoulder. Yes, it’s all a tad exciting. What should eventually temper the euphoria is the pressing importance of the Rangers’ decisions in the draft and free agency. It’s a pivotal offseason for a franchise that’s ready to see progress toward a return to winning ways. Failure to land Panarin or more importantly, deliver on their huge draft haul, will set the Blueshirts back immeasurably. Fans, though, can’t help but be engaged and excited for now. Other than some strange answers during an interview from goaltending super-prospect Igor Shestyorkin – also expected to arrive in North American from the KHL by signing a two-year entry level deal with the Rangers this summer – there’s simply too much happening over the next three months not to be fired up about the potential future on Broadway.